use downtime levers as I have arthritis in my right thumb joint. I have used cheaper levers but these change superbly with very little force required. I've used the 10-spd Dura-Ace downtube shifters for a couple of years. I have a chainset that works best with 9-spd and I have found myself shifting twice so many times, since 10-spd is just a little too fine-grained at times. So I picked up these, and you just can't get them from anywhere. SJS is a reliable source for reliable components. I am a long-distance cyclist, audax/randonneuring. I can have problems with my hands with brifters. I don't move my hands enough. Down-tube shifters force me to move my hands, and it helps, very clearly. I use these levers on my two road bikes, one is 105 and the other is Dura Ace and they work great with both. In the details it says 76g, but the specification says 198. Apologies for the confusion, the levers and the boss covers weigh 76grams but the entire boxed package (including cables and instructions) weighs 198grams. Are both levers index? Or is the left hand side for the front mech friction?? The right hand shifter and the left side is friction. 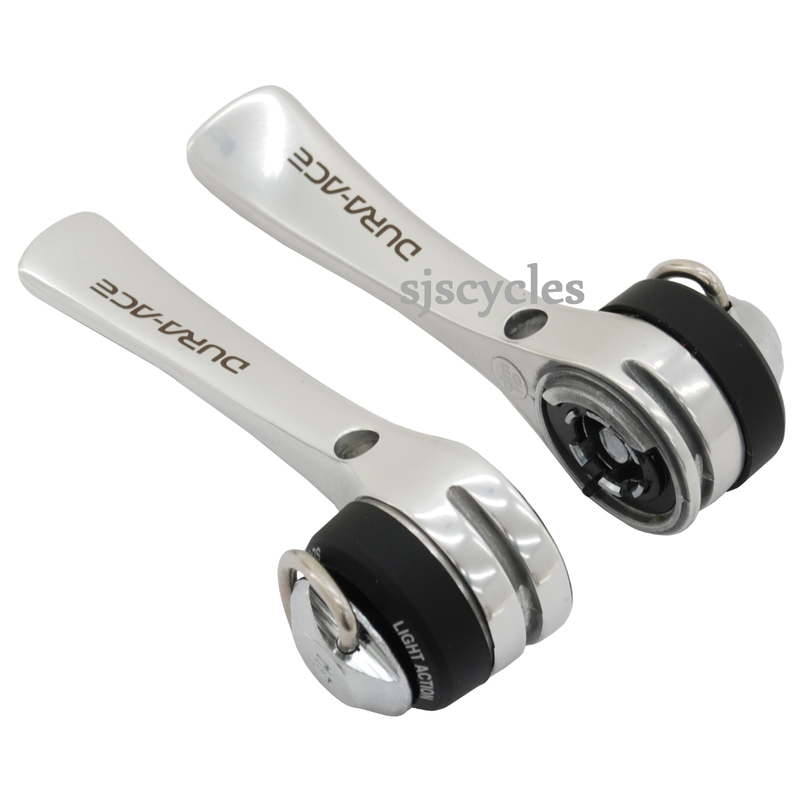 Hi, can you confirm that these fit the 'Jtek Special Thumb Shifter Brackets' (I want to replace some damaged Dura Ace bar end shifters mounted as thumbies and prefer these). Unfortunately not, the shape of the fixings for bar end shifters and down tube shifters are different. The Jtek Thumb shifter brackets are only designed for use bar end levers so won't work with down-tube shifters i'm afraid. Would These Shifters Be Compatible With My Campag Mirage 9 Speed Rear Mech/11-32 Set Up. Hi, you will need a Jtek Shiftmate 3 to make Shimano speed shifters work with a Campagnolo speed derailleur and cassette. It's our part number 19048. It says in the description that there index only yet in the picture it clearly shows a friction setting ?? I'm afraid that photo is not up to date and all of the current shifters we are getting are Indexed for 9spd only.